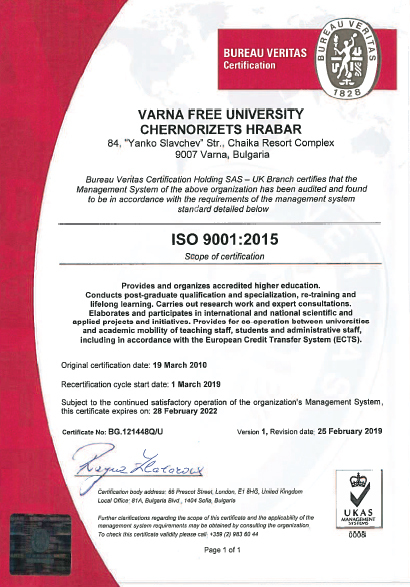 Varna Free University “Chernorizets Hrabar” was awarded its third institutional accreditation for the maximum validity period of 6 years, with a mark of 9.12 out of 10. The accreditation document is awarded by the National Evaluation and Accreditation Agency (NEAA). 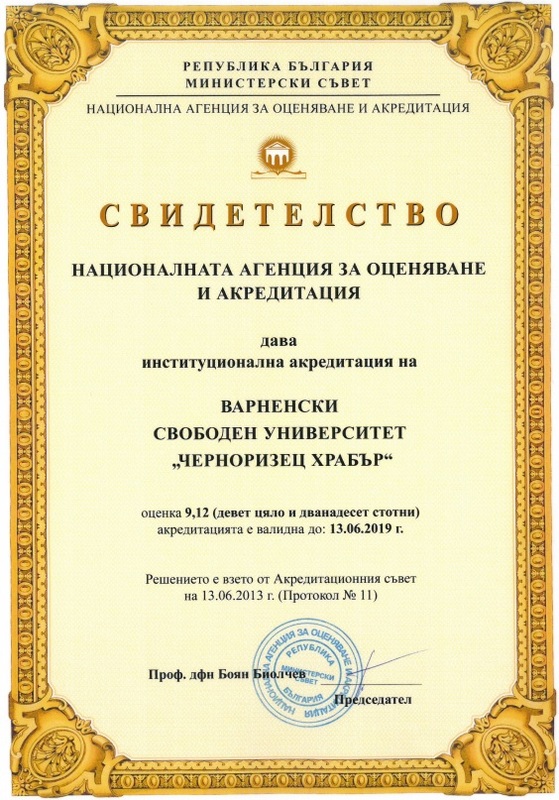 This mark is amongst the highest marks ever awarded to a higher education institution in Bulgaria. The high accreditation mark comes as a result of the university’s effort to continually enhance the quality of education and adapt curricula and student training to the dynamics of the labour market. It is a guarantee for the high quality of the academic product and the strategic development of research. On 28 February 2016 the university received its fourth certification by the international certification organisation BUREAU VERITAS Certification in compliance with the ISO 9001:2015 international standard, and was awarded accreditation certificates from UKAS (Great Britain) and ANAB (USA) for a validity period of 3 years. ISO is an international standardisation organisation comprising organisations from over 100 countries around the world.Its work is dedicated to developing different standards for quality management in diverse spheres of business life. The ISO standards have been officially adopted by the European Committee for Standardization (CEN), replacing national standards with internationally-adopted ones. The international standards are used to enhance communication and international cooperation on a global scale. Provision of accredited higher education, organisation of postgraduate qualification and specialization, requalification and lifelong learning. Research, expert and consulting work. Development and participation in national and international applied research projects and initiatives. Provision of interuniversity cooperation and academic mobility for lecturers and students (also under the European Credit Transfer and Accumulation System (ECTS). Business activities in direct relation to, or in support of, the university’s main fields of operation. Integration into the international academic space. Independent and objective evaluation of the quality management system’s performance. Adoption of clear-cut criteria and indicators for the work of the different departments and bodies of the university. Encouragement of systematic and precise documentation keeping. Timely and objective detection and definition of problems. Provision of support for the university’s management upon decision-making.